From a single water feature to a fully functioning waterfall or pond, our crew is ready to install. We install Aquascape Pondless Waterfalls, Ponds, and water fountains with lighting accessories if desired.. Custom built waterfalls with large boulders are built to order. Peruse Aquascape's website to see all that is available. 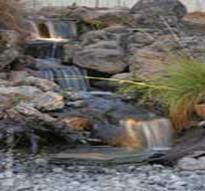 We also provide Pond and Waterfall Maintenance including Spring Start Up and Winterization. Monthly maintenance for your pond or water feature is available to give you peace of mind.